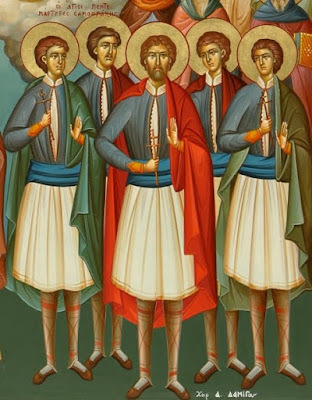 On the Sunday after Pascha (the Sunday of Saint Thomas), we commemorate the Holy Five Neomartyrs of Samothrace: Saints Manuel, Theodore, George, George the Younger, and Michael. 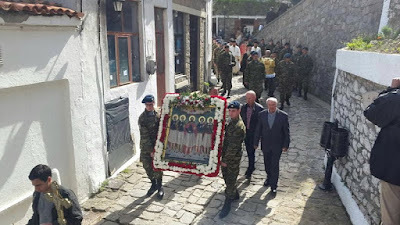 Are now rightly celebrated in Samothrace. These Holy New Martyrs were from Samothrace, with the exception of Saint Michael who was from Cyprus. During the Greek Revolution of 1821, the island of Samothrace was occupied by the Turks, who came from Abydos and Tenedos and murdered the Christians inhabitants, while many women and children were taken as slaves to the East and Egypt. 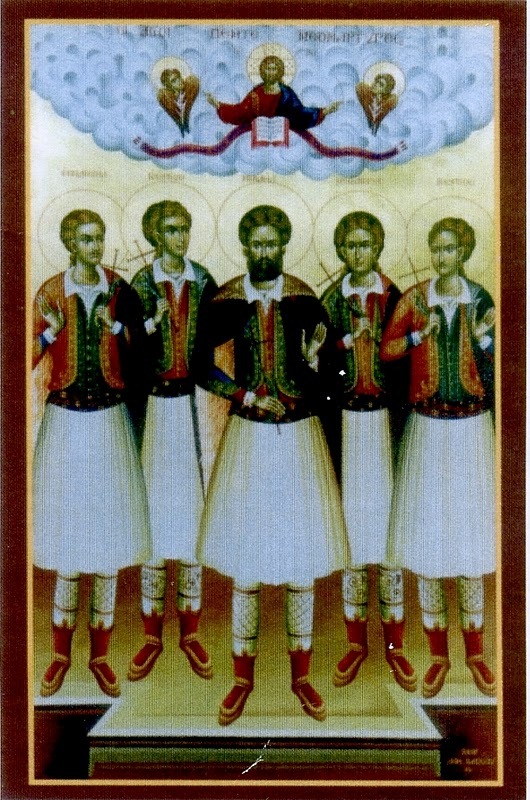 Then afterwards, the four martyrs along with Saint Michael (who denied his faith and converted out of fear), were sold throughout various places in Turkey. 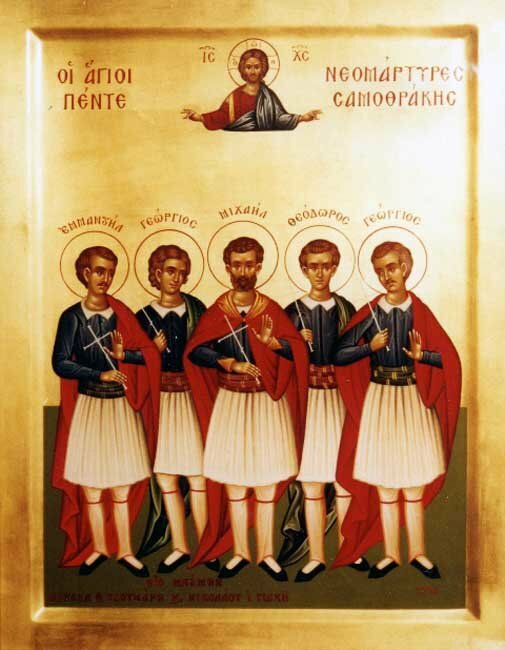 When Greece was liberated, the Five New Martyrs returned to Samothrace and followed a Christian life. 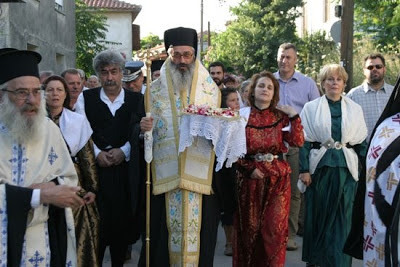 At the time, the one appointed to the position of Kadi (Judge) in Makri was a tough man named Apturachman, who was inhuman and a zealot for Islam. In the year 1835, he captured the Martyrs and imprisoned and tortured them. Despite the terrible tortures, the Martyrs confessed their faith in Christ. The Kadi then wrote to Constantinople to his boss Vasaf, who was a secret secretary of Sultan Mahmoud, informing him about the Martyrs who denied the religion of Muhammad. The decision came back as a conviction. The first to be martyred was Michael, the oldest, who was cut to pieces with their swords. 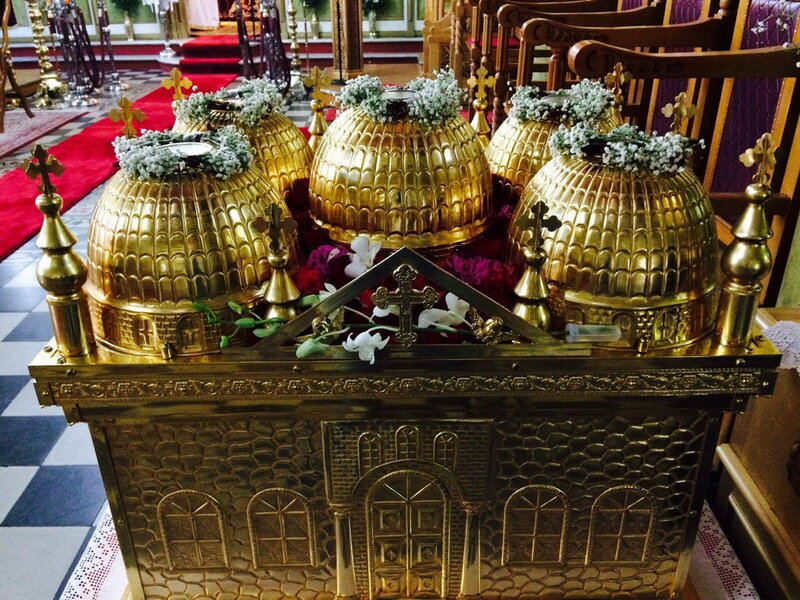 Theodore and George were hanged and so received the crown of martyrdom. The much-suffering Manuel was thrown on iron hooks and was pinned in the shape of the Cross. They cast the blessed young George on the hooks similarly, but - O the miracle! - the nails bent and did not at all pin the body of the Saint. After this they threw him on iron spits and stepped on him so that his body would be pierced. In this way the martyr Manuel quickly delivered his holy soul into the hands of God, while the martyr George stayed nailed for twenty-four hours in unbearable pain. These Turks, when they saw that he was still alive after so long, shot him in the head, and thus ended the life of this glorious martyr. 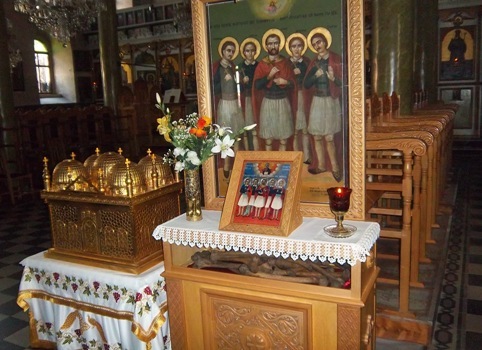 Christians, having received the authorization, buried the remains of the Holy Martyrs at the place of their martyrdom. The five Holy Skulls of the Neomartyrs of Samothrace are treasured in the Church of the Dormition of the Theotokos in Chora of Samothrace. 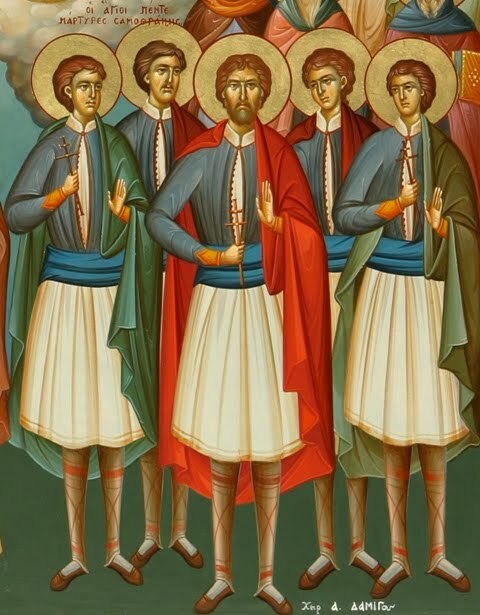 As mentioned, their feast is celebrated on the Sunday of Antipascha (the Sunday of Saint Thomas, which is the first Sunday after Pascha), because they were martyred on April 6th, which was the Monday of Saint Thomas. O lamps of Samothrace and adornment of Makri, you were shown forth truly as divine Neomartyrs, you struggled steadfastly for Christ and destroyed the delusion of the enemy, Manuel with Theodore and Michael, and the dual Georges: Glory to Him Who strengthened you, glory to Him Who crowned you, glory to Him who bestows on us through you grace and mercy. 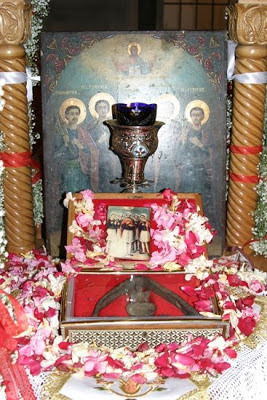 The Relics and Implements of Martyrdom (iron spike and nail) from the Holy Five Neomartyrs of Samothrace, from the Church of Saint Anastasia in Makri.